Google has been quietly developing a YouTube Developer Program with platform companies to bridge the gap between brand channels and viewers, according to companies participating in the program. It will give brands more template-style options. The tools, developed by digital agencies, will support YouTube's move to build out its channel strategy -- another step closer to turning the video site into an online broadcast network. The BUDeSYSTEM from The Buddy Group, which developed a CMS powering the MyBusinessStory channel from Google and American Express, is one of three platforms with features YouTube recently approved to support channel partners. 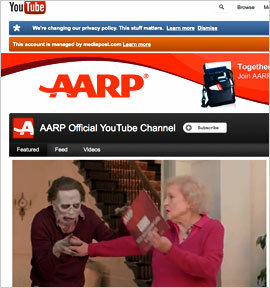 AARP signed on to use the CMS platform in preparation for YouTube's next upgrade, expected March 7. YouTube has been working for years with developers interested in building applications through an available API, but a Google spokesperson could not comment specifically on a Channel partner program. The Buddy Group Chief Creative Officer Bryan Boettger said the "developer program is just getting off the ground, which will open up to a broader range of companies" based on features approved in some of the template options. "They are determining the process and coming up with terminology," he said. "They are talking with a lot of agencies that might be candidates to participate." As part of the startup program, Boettger calls the BUDeSYSTEM platform a "sales funnel gadget" that supports brands like AARP developing custom video content for Channel page visitors. Google opens an iFrame for brands and BUDeSYSTEM, running PHP, enables brands to create custom URLs that take those clicking through to the Channel from an ad to a specific path of videos. The Buddy Group will create a path for viewers to search through AARP Channel page videos. Views grew in 2011 to 3.5 million -- up from 100,000 in 2010 -- but Tammy Gordon, director of social communications and strategy at AARP, expects its Channel strategy to catapult views much higher by the end of the year. "As we look toward the third and the fourth quarter, I want to double the amount of views on the Channel," she said. The Buddy Group will help build a "platform for the next generation of television, not just a site housing a collection of videos," Gordon said, explaining her choice for choosing the company out of about three or four developers. Gordon believes that eventually the AARP YouTube Channel will stream across several sites and Internet-connected platforms. Those platforms could include Google TV and Samsung, serving up content from sites like YouTube or Hulu to AARP's 35 million members and beyond. When asked how potential viewers will find the Channel when they don't know it exists, Gordon pointed to paid marketing and email campaigns, as well as creating content that viewers will more likely share.